This model (eSSL LP-400) is a fingerprint Time and Attendance System which can be integrated with the printer also. One can register 3000 users in this system. It can store 1,00,000 records at a time. This machine performs very good as it has 500 DPI optical sensor in it. There is an in-built proximity card reader which takes only 1.5 seconds to identify the thumb impression. Its MS-SQL and Oracle version is also available. Biometric Attendance Machine can help you in cost saving. This device can bring punctuality in your organization as it helps you in monitoring your employees in and out time. Don’t wait to call us or write us we are always available for you to provide best solutions. Built-in USB port allows for manual data transfer when the network isn’t available. Audio-visual indicators for acceptance and rejection of valid/invalid fingers. Please email us at info@ampletrails.com or call us at +91 9315441078 WhatsApp 9315441053, 9818390836 for pricing and installation of this machine. Biometric Attendance Machine can help you in save cost as it helps you in monitoring your employees in and out time. It comes with a software which is capable of generating 150+ industry standard reports. This machine comes with a free software for payroll management of your employees. It has a feature of admin lock in which only admin would be able to make any changes in the machine data. Don’t wait to call us or write us we are always available for you to provide best solutions. SDK available for OEM partners and software developers. We can use this machine for Canteen Management System. Email us at info@ampletrails.com or call us at 9818390836 for pricing and installation of this machine. Fill the following form to get in touch with our experts. 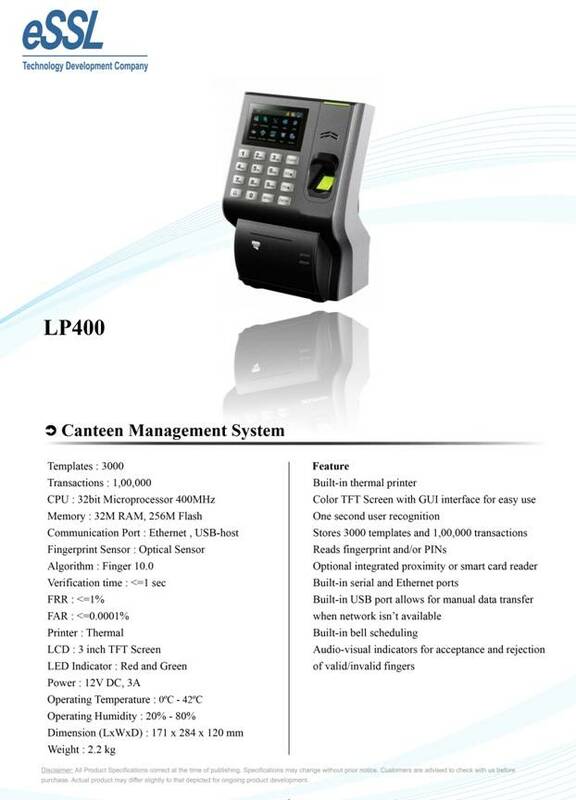 Working videos of LP 400 Canteen Management Device. 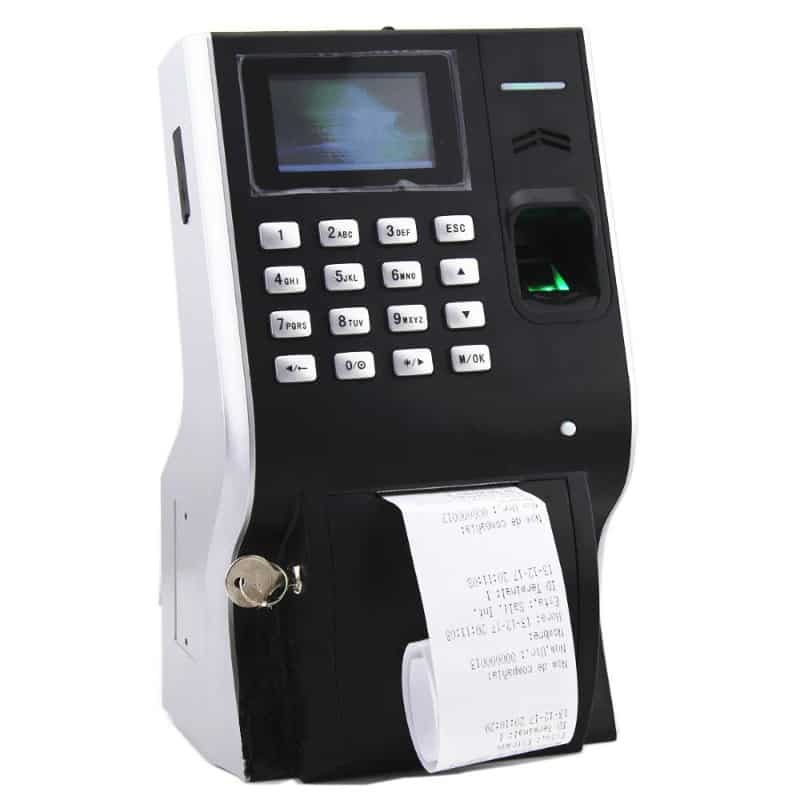 LP400 is a printer integrated biometric time attendance device, the latest fingerprint time attendance device of ZK software with built-in thermal printer. LP400 features are the fastest commercial-based fingerprint matching algorithm and high-performance, high-image quality optical fingerprint sensor. The 3″ TFT can display more information vividly, including the fingerprint image quality and verification result etc. TCP/IP communication is standard and make sure the data transmission between terminal and PC can be easily done within several seconds. 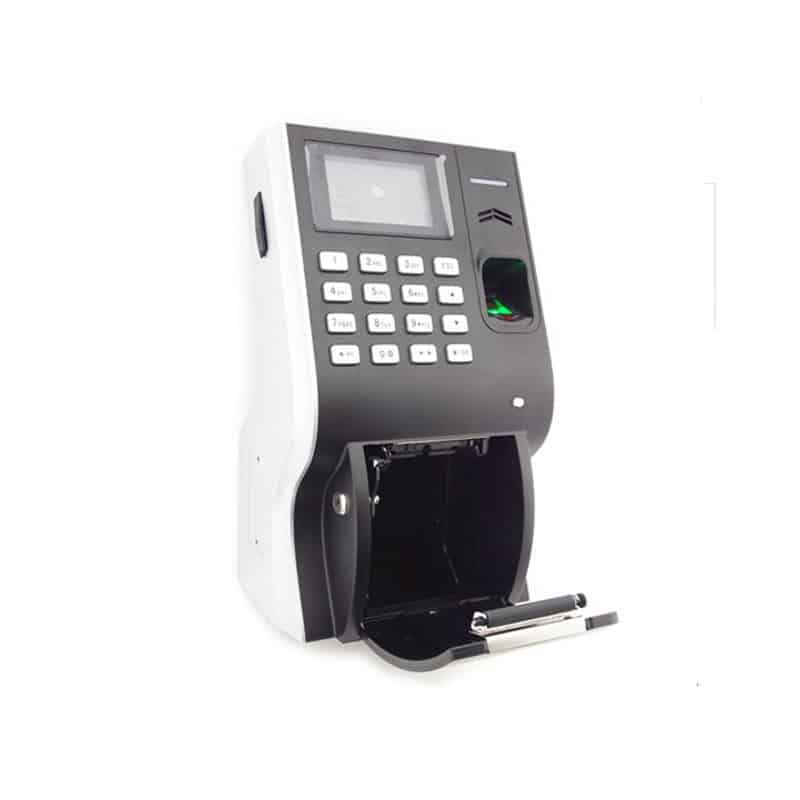 LP-400 is a biometric time attendance device which can be integrated with the printer also. We can store up to 3000 users in this biometric system. Time attendance logs up to a count of 1,00,000 can be contained in the time attendance device at a time. With the 500 DPI optical sensor in it and an inbuilt proximity card reader which takes only 1.5 seconds to recognize and register the attendance entry of users. Biometric Time Attendance Machine has an ergonomically design. This device can bringing punctuality in your organization as it helps you in monitoring your employees in and out time. Right People in Right Place at Right Time Cafeteria Management is a completely automated solution, starting from planning an order to delivery, including payments. Cafeteria Management System allows tracking menu items, speedy transactions, preventing accounting errors and reducing wastage of food. Matrix COSEC Cafeteria Management is a completely automated solution, starting from planning an order to delivery, including payments. Cafeteria Management allows tracking menu items, speedy transactions, preventing accounting errors and reducing wastage of food. COSEC MIRROR is an application that allows a user to select menu items from any Android device (TV or Tablets) instead of a door controller. Same user interface is displayed in the Android device as is displayed in the door controller.